I was introduced to this monstrosity though the NPR column Sandwich Monday. Given that I’m all about the one-liners and puns, their humorous take on a new sandwich every week is something I look forward to at the start. Some are just foul — I’m looking at you, energy bar sandwich — but from time to time they feature one that piques my interest, despite being a self-proclaimed sandwich hater. So here we are, The All-American Burger. (This is turning out to be a very patriotic week on the blog, huh?) Not one, but two grilled cheese sandwiches, a burger patty, bacon and sautéed onions (I used shallots). While the original from the Saloon Steakhouse in Chicago features a slick of “chef’s special aioli,” I just couldn’t bring myself to including the same in my version. Guess what? It wasn’t missed — the burger turned out spectacularly greasy even in its absence. Would you give this a shot — or is it just way too over the top? In a small, cast iron skillet over medium heat, melt about 1/2 tablespoon of the butter. Sauté shallot until softened and browned in spots. Remove from pan and set aside. Cook the burger however you like or as follows: Set the cast iron skillet used to cook the shallots over medium-high heat. Once hot, arrange patty on the pan, cook for 1 – 2 minutes on the first side. Flip and cook for about 2 minutes more³. While the burger cooks, make grilled cheese. Set medium-large cast iron skillet or a griddle over medium heat. Spread one side of each bread slice with butter. Onto the hot skillet, place two slices of the bread — buttered side down. Top with cheese and other bread slices (buttered side up). Cook until crispy and browned on the first side, flip and cook — pressing down on sandwiches with the back of a spatula — until bread is crispy and browned and cheese is melted. 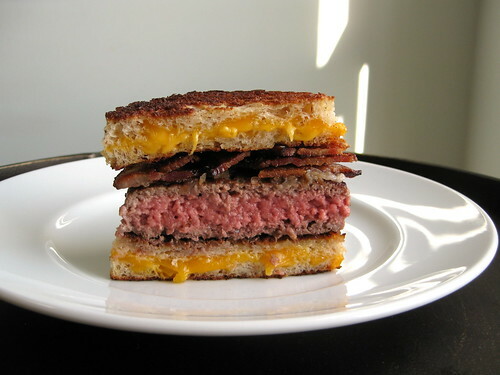 Top one grilled cheese sandwich with cooked burger, shallot, bacon and second grilled cheese. Serve immediately! ¹ Available through their online store or at Whole Foods (freezer section), Trader Joe’s, some Target locations and more! To find a store near you click here. ² I don’t usually go for the tinted varieties, but orange cheese is kind of a must here. ³ The inside will be pink. Please note that consuming raw or undercooked beef may increase your risk of foodborne illness, especially if you have certain medical conditions.